David's Brisket House in Bay Ridge has become "My Brisket House"
We stopped by for lunch last Sunday - the Bay Ridge location. We got a scare - the storefront had been renamed from “David’s” to “My Brisket House.” It turned out not to be a problem. The inside looked the same, the staff were the same, and the pastrami remains terrific. Just perfect. Moist, delicious, perfectly spiced. We had the medium pastrami sandwiches which, at $12, were larger than the sandwiches at Katz’s. 9/30/2015 good afternoon.i apologize that you was unsatisfied.about the change of the name we are founders of David’s Brisket House. family-owned business established since 2008 and changed the business name from David’s Brisket House to My Brisket House at 2105 because we split partnership do to they want to expand with there own family. We’re here to take it to the next level. We take great pride in our restaurant and hope to continue serving Brooklyn for many more years to come.i appreciate your rating. in god’s will we’ll satisfy you on your next time around. 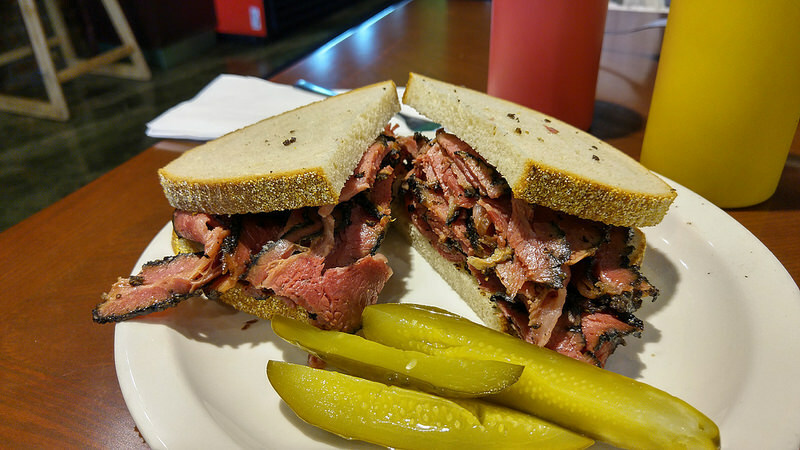 That looks like some good pastrami! Is it kosher? The people who run the place are Muslims from Yemen. It’s halal compliant. The folks who run the place are incredibly nice. Last June on impulse we stopped by for sandwiches at 7:30PM on a Friday night, not realizing they were closing early for Ramadan. They were about to pull the gate down but they still made our sandwiches to go. They were terrific.